Dymax UV and visible radiometers are simple to operate and allow operators to monitor and document a UV/Visible light curing process. A low UV/Visible intensity measurement signals an operator to replace the bulb, reflector, or lightguide. Radiometers can also be used to confirm that operators are properly shielded from UV/Visible exposure. Degradation of curing bulbs, lightguides, and reflectors can decrease intensity, resulting in incomplete cures. 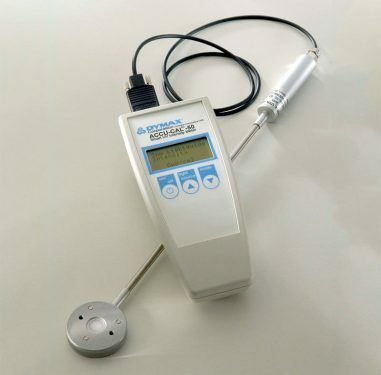 A radiometer helps to ensure that a light-curing system is providing the intensity and dosage levels required for successful curing. ACCU-CAL™ radiometers are sufficiently sensitive to measure the intensity of stray or reflected energy (as little as 1 mW/cm2). Dymax recommends that worker UVA exposure not exceed 1 mW/cm2. For reference, UV (320-395 nm) intensity on a sunny day can range from 2-6 mW/cm2. A radiometer can be used to measure the transmission rates of various wavelengths through substrates that sometimes absorb various frequencies of energy. To assure an effective curing process it is critical to measure the light intensity reaching the cure site below any intervening substrate. Consistent UV curing requires periodic monitoring of UV intensity or dose. The Dymax ACCU-CAL 160 radiometer greatly simplifies both validating and monitoring a light-curing process. Consistent UV curing requires periodic monitoring of UV intensity or dose with a UV intensity meter. The Dymax ACCU-CAL 50 Radiometer is simple to operate and offers repeatable measurement of UV light.